Aberdeen manager Derek McInnes has issued a staunch defence of his captain Graeme Shinnie following criticism of his display in Scotland’s 3-0 defeat in Kazakhstan. The Dons midfielder questioned whether he would play for his country again following a poor display at left back where he deputised for the national team in the absence of injured left backs Andy Robertson and Kieran Tierney in the opening Euro 2020 qualifier and did not feature in Sunday’s 2-0 win in San Marino. Shinnie’s display has been the subject of much debate among pundits with one, former Raith Rovers striker and current regional radio regular Gordon Dalziel, last week questioning what Shinnie brings to the game. Dons boss McInnes believes the criticism of his captain has been unjust. The Aberdeen manager said: “For Graeme to have taken so much criticism has really angered me over the last little while. It is bang out of order. “Graeme is guilty of being too honest for his own good. He only played a part on a miserable night for the country. Everyone else played their part. Everyone involved has to take their responsibility. “Graeme is someone who playing for their county means so much to him. “I can understand his disappointment that he has not managed to take his opportunity and not showed what he is capable of. “It was not his performance or what he did for the goals, it was more his positioning. His positioning beat him rather than anything he did and that probably comes from not having played the position for a while. 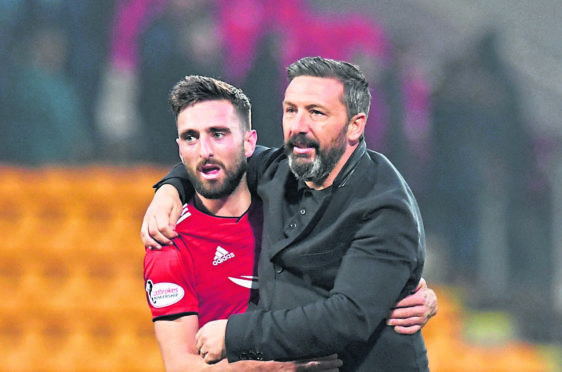 Shinnie’s international duty has been a testing one but his club manager has backed his influential skipper to respond strongly when he returns to Dons duty this week. McInnes said: “Graeme will bounce back quickly. “He is that type of player. If I could have a team full of Graeme Shinnies I would have them. I would not swap him for anyone. “He means everything to me and how we want to play. He is someone who is so fiercely driven and fiercely competitive.